Dustin Garis is Tuesday's keynote speaker for the Visit NC 365 Conference, in Wilmington March 31 - April 2. A world-renowned brand innovator, Garris has become known as "Chief Troublemaker" for his innovative approach to brand-building, customer experience, and change leadership. His deep insights and charismatic persona keep audiences captivated while helping organizations embark on the next frontier of innovation. With a particular focus on how brands can enrich lives, Garis offers examples of brands that are getting it right by "revolting against routine," and creating memorable experiences to drive engagement among Millennial consumers and employees. New this year, Visit NC is offering a Meet & Greet session on Sunday afternoon. New and veteran attendees can meet Visit NC's 14-member team. Use this opportunity to see how to get the most out of Visit NC and the annual tourism conference. Also new, Visit NC is offering facilitated networking opportunities during the Monday and Tuesday breakfast sessions. Plan to arrive early each morning for facilitated discussions based on region and budget size. The registration rate is $499/person. Click here to register. When you register, don't forget to share in the action with the hashtag #VisitNC365 on Twitter @NCTourism and Facebook @NCarolinaTourism. For more information on the conference, contact Dana Grimstead at (919) 447-7761. Sponsorship opportunities are also available, offering a range of options. Next week, on Thursday, Feb. 7, tourism-related businesses in Edenton and Chowan County - plus the surrounding counties - will have an opportunity to work with Visit North Carolina staff to learn about its research, development and marketing services, and discuss best practices in reaching travelers, the media and increasing tourism visitation and spending. Visit North Carolina's Tourism Resource Assistance Center (TRAC) is a community-based training program designed to help small tourism-related businesses. TRAC will be held 10 a.m. - 2 p.m. at the 1767 Chowan County Courthouse, 117 E. King Street in Edenton. Representatives from the EDPNC's BLNC, N.C. Welcome Centers/Visitor Services, N.C. State Parks, Agritourism, and NC GreenTravel are often on hand to discuss services they can provide businesses, including strategic planning, assisting with identifying funding sources and serving as liaisons with other local, state and federal agencies. For additional information on this session or to learn more about scheduling a TRAC visit to your community, contact André Nabors at (919) 447-7771. On Tuesday (yesterday), NBC's Today included the Brevard area in its "4 getaways to book for National Plan for Vacation Day." In addition to the many waterfalls, the area was noted for kayaking and hiking, with the Greystone Inn suggested for accommodations. Today's lifestyle & travel correspondent Dayvee Sutton participated at Visit NC media missions in Atlanta and Charlotte, attended the 2017 Visit NC 365 Conference, and was later hosted by the Transylvania County TDA. 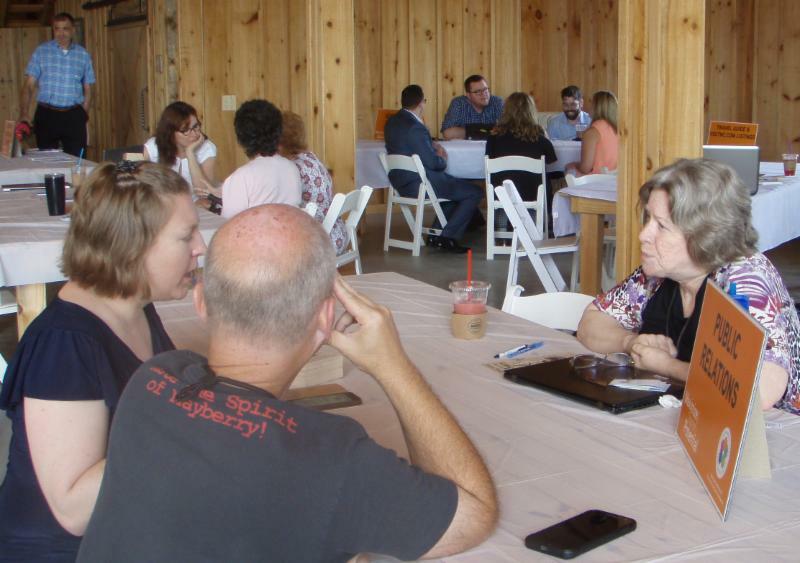 The media relationship and resulting story are a direct result of Transylvania County TDA's partnering with Visit NC's PR efforts. 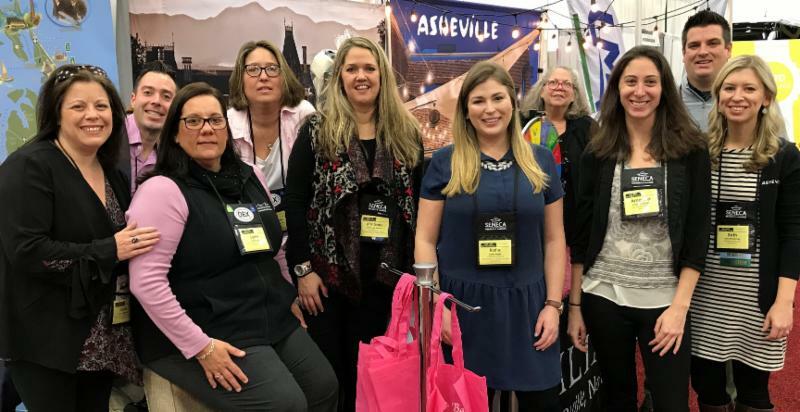 This past weekend, Visit NC attended The New York Times Travel Show in New York, partnering with Outer Banks VB, Greenville-Pitt County CVB, Rockingham County, New Bern CVB, Smithfield/Johnston County, Ocracoke Civic & Business Assn. and Crystal Coast Lady Cruises. The booth saw a steady amount of traffic throughout the travel show, which saw an attendance of nearly 30,000 consumers, travel agents, bloggers and travel writers. Consumer travel shows offer additional opportunities for Visit NC and interested partners to promote travel to North Carolina to potential visitors who are actively looking for travel suggestions and information. Partners interested in participating in future shows with Visit NC should contact Andre Nabors at (919) 447-7771. 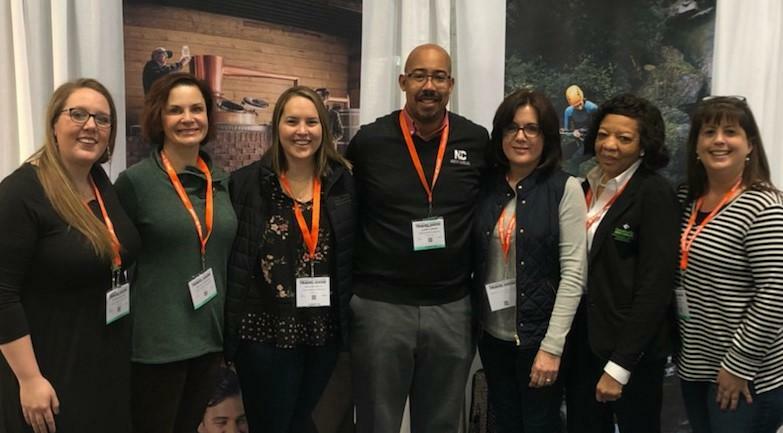 More than 20 industry partners joined Visit NC's Amanda Baker at the 2019 American Bus Association (ABA) Meeting & Marketplace, one of the premier industry events for group travel, this week in Louisville, Ky. More than 3,500 delegates attended this year's conference, engaging in pre-scheduled meetings, networking events and educational sessions. Visit NC took more than 30 appointments with tour operators during the week, promoting group travel throughout the state. These qualified leads will be available in the coming weeks. During the Dine Around night, a networking event for tour operators was hosted by Visit NC and N.C. partners Cabarrus CVB, Charlotte Motor Speedway, Visit Charlotte, Days Inn Outer Banks, Hilton Garden Inn Kitty Hawk, Outer Banks VB, Ramada Plaza Nags Head, Visit NC Smokies and Visit Winston-Salem. For more information on Visit NC's group travel program, such as ways to attract this market to a particular destination, contact Amanda Baker at (919) 447-7765. American Airlines is adding a new, daily flight from Dallas Fort Worth International Airport to Asheville Regional Airport. The nonstop service from DFW to AVL begins May 3. 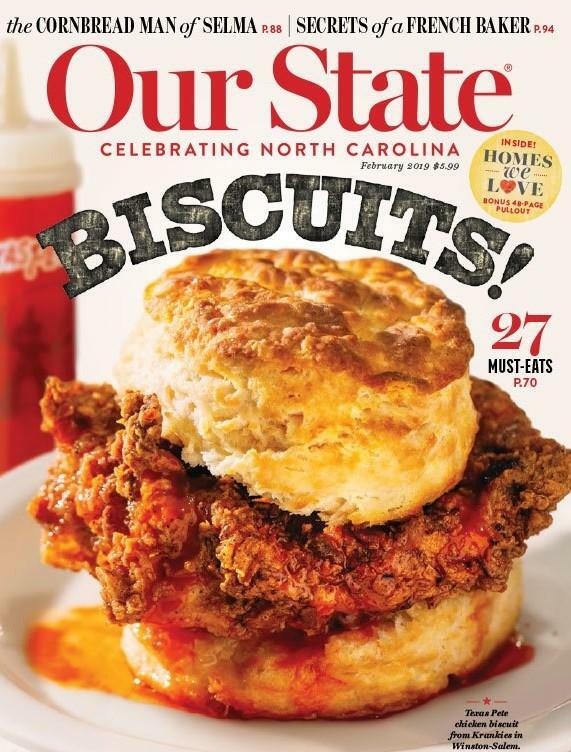 The February issue of Our State magazine spotlights biscuits with 27 "must-eats." "Downtown" tours Apex; "Restaurant" features Lou Reda's in Rocky Mount; "Short & Sweet" samples Black Mountain Chocolate in Winston-Salem; "Gathering Place" highlights Molley Chomper Hard Cider in Lansing; and "Farm Tour" visits MG3 Farms in Maxton. The February issue is available now. For the week of Jan. 31, North Carolina Weekend continues the second part of its new format: running eight episodes, one each week, and then repeating those episodes for the following eight weeks. So this week's episode is a repeat of the one that originally aired Nov. 28, spotlighting the Carolina Touring Company in Raleigh; Sanctuary Vineyards in Jarvisburg; Enchanted Airlie in Wilmington and Denton Farm Park Holiday Train in Denton; and the East Carolina Wildlife Art Festival in Washington. (Check local listings; segments are subject to change.) North Carolina Weekend is underwritten by Visit North Carolina. In addition, UNC-TV has recent editions of North Carolina Weekend available online. Canada is the top country of origin for international visitors to North Carolina. In 2017, approximately 388,500 Canadians visited the state, spending $217 million. For more North Carolina visitor information, visit the Partners Page or contact Tourism Research Director Marlise Taylor at (919) 447-7748. Feb. 2-6 - CARVC Conference & Expo, North Myrtle Beach, S.C.